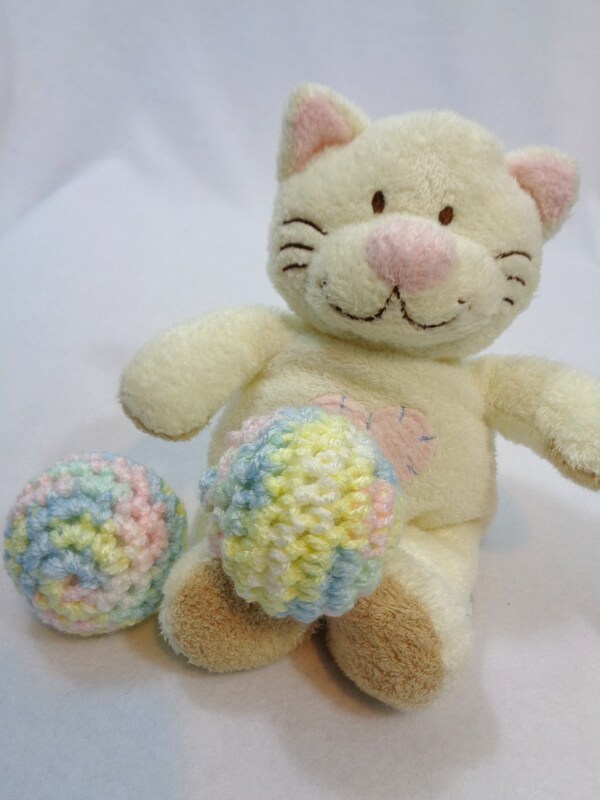 These pastel crocheted kitty cat toys would make the perfect gift for your kitty's Easter basket. I've crocheted them from acrylic yarn and stuffed them with polyfil. I've added a large jingle bell to each one. My own kitties have some of these and LOVE them. What kitty doesn't like a yarn ball, and then add that jingle bell and they think it's great. These balls measure about 7 inches around. They fit nicely in my hand. They are made from fun shades of pastel yarn, so they are perfect for spring, or for anytime! Spoil your kitty or kitties today! They would make great housewarming gifts for your friends with cats. Or buy some for your cat and your grandcats! If you need them in a different color or want some more, please let me know so I can make you a custom listing. Stuffed cat shown in picture, not included in purchase.